Romania is located in Southeastern Europe. Romania is located in Southeastern Europe and shares it’s borders with Bulgaria, Hungary, Moldova, Serbia and Ukraine . Romania’s capital and largest city is Bucharest. Come and see clifftop Bran Castle, long associated with the Dracula legend. Romania’s climate makes it a year-round destination. The south has hot summers and mild winters, while in the northern mountains, winters are harsher and summers are cooler. Tourist season peaks sharply in July and August only along the Black Sea Coast; elsewhere, travelers will find a refreshing lack of crowds even in mid-summer. Travelers would do well to remember, however, that summer can be brutally hot in much of Romania. Bran Castle (Romanian: Castelul Bran; German: Törzburg; Hungarian: Törcsvár), situated near Bran (Transylvania) and in the immediate vicinity of Braşov, is a national monument and landmark in Romania. The fortress is situated on the border between Transylvania and Wallachia, on DN73. 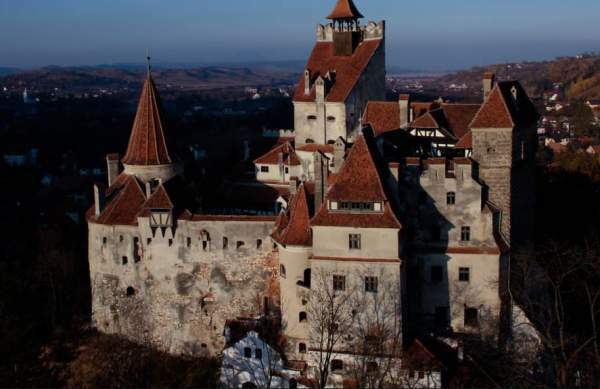 Commonly known as “Dracula’s Castle” (although it is one among several locations linked to the Dracula legend, including Poenari Castle and Hunyad Castle), it is the home of the titular character in Bram Stoker’s Dracula. There is, however, no evidence that Stoker knew anything about this castle, which has only tangential associations with Vlad III, voivode of Wallachia, the putative inspiration for Dracula. As discovered by the Dutch author Hans Corneel de Roos, the location Bram Stoker actually had in mind for Castle Dracula while writing his novel was an empty mountain top, Mount Izvorul Călimanului, 2,033 metres (6,670 ft) high, located in the Transylvanian Călimani Alps near the former border with Moldavia. The castle is now a museum open to tourists, displaying art and furniture collected by Queen Marie. Tourists can see the interior individually or by a guided tour. At the bottom of the hill is a small open-air museum park exhibiting traditional Romanian peasant structures (cottages, barns, etc.) from across the country. Romanian Wines – Four Thousand Years in the Making – James Meléndez / James the Wine Guy. Romania is the 7th largest wine producer in Europe and 11th in the world. There are approximately 195,000 hectares / 481,000 acres planted. Romania has a rich tradition of viniculture for over 4 millennia–few nation-states can say the same. According to legend the Greek God Dionysus was born in Dobrogea – southeast Romania. Romania is in similar latitude bands as France, Spain, Italy, Slovenia, Croatia, Hungary and Austria. Generally northern Romania there are primarily white wine grapes grown in this area; central Romania has a mix of both red and white and south Romania is predominately red wine grapes. Romania is a land of higher elevation and has a continental climate–there are sea influences from the Black Sea. Romania produces both indigenous grapes: Fetească Albă, Fetească Regală, Fetească Neagră, Băbească Neagră as well as international varietals: Merlot, Cabernet Sauvignon, Sauvignon Blanc, Chardonnay and Pinot Gris. And encompassing smaller wine districts inside each larger wine region. Romania’s lineage is certainly ancient and new. But few have 4 thousand years of history but Romania like most other wine producing nations has newness as well. A sense of finding it’s consumer base, refining it’s wines, training native Romanians to go abroad and bring back knowledge to produce high quality and impressionable wines. Romania has had an uninterrupted wine history despite many historical interruptions. I think many people are relying too heavily on the past communist era as significant and interfering with wine production–and despite these years of collective farming –wine was still being produced. A larger picture is the framework and heritage that is Romanian wines–that is a significant picture. And we are more than a generation away from the communist regime–the Romanian wine industry is geared to have many glasses to fill. Romanian wine production is far too large to not have a larger distribution trajectory. And the world is awaiting to taste Romanian’s wines. The Rough Guide to Romania. Whether you’re tracking wild bears, dancing with Gypsies or braving Dracula’s lair, you won’t set a foot wrong with The Rough Guide to Romania. From the folk customs of Maramure? and painted monasteries of Bucovina to Bucharest’s thriving gastronomic scene, Rough Guides’ freshly updated seventh edition takes you on a time-travelling trip around this most diverse of destinations. With a section of suggested itineraries, plus detailed maps and gorgeous full-colour photographs throughout, you’ll feel inspired to step off the beaten track and really explore Romania’s wealth of cultural riches. Our local-expert authors have also peppered The Rough Guide to Romania with anecdotal titbits, hand-picked tips and unparalleled historical background to ensure you squeeze every last drop of potential from your travels. Home to the Carpathian Mountains, the Danube river and the region of Transylvania, the famous setting for the chilling tale of Dracula, Romania is also known for the sandy beaches on its Black Sea Coast. Romania’s capital, Bucharest, is an elegant, cosmopolitan city. You can unearth hidden treasures in its fascinating museums, take a stroll along the avenue of Calea Victoriei and take in the sheer spectacle of the huge Palace of Parliament. Romania offers a rich tapestry of tourist attractions and vacation experiences unique in Central-Eastern Europe: medieval towns in Transylvania. Take A Break Holidays takeabreakholidays, Romania Accommodation.